Wife said NO YOU DON'T NEED IT! after you just got a new rifle, So today i came up with this, Then she says OH i thought you would just buy one, I can't win. P38, distant stalker, Pengy and 6 others like this. Get her to hold your rifle a couple of times while you clean it. Then, when she starts bitching, tell her you won't need her help if she goes halvies with you in Tipton's Best. What colour paint Gibo do you find does the best job? P38, Blisters and Awaian like this. I have owned, used, and worked on all types of firearms for the last 60 years and never needed a gun vise. 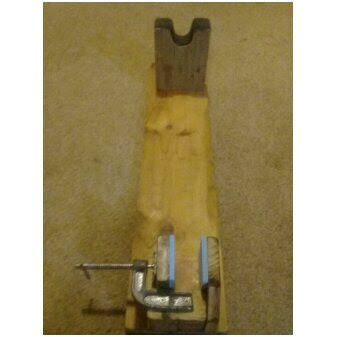 I make padded jaws for my regular bench vise and have an adjustable tubular support that goes in a hole in the bench. That works perfectly for everything including checkering. For bore sighting I use a box with a padded vee cut in each end. sometimes, WallyR and Awaian like this. i will sell my tipton for $70 for anyone who wants it to pick up in christchurch. True! I could do with some more like that now.